A unique assortment of beads and cup chain creates a sweet bracelet that makes a huge statement. On a foundation of two holed tila beads, sparkling cup chain is secured with bugle beads and tiny seed beads. A mighty but small magnetic clasp creates the perfect finale! This is a beginning / intermediate level class. $15 materials fee will be added to class fee when you register. 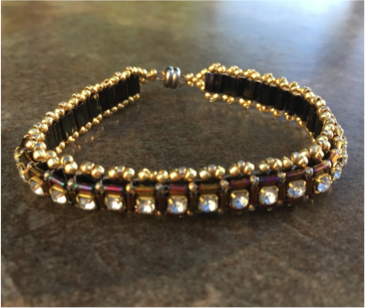 Instructor: Chris Eisenberg discovered beading while recovering from an accident and the resulting traumatic brain injury. Beading was her therapy and credits it for helping her become whole again. Chris has a doctorate in classical piano performance from the University of Northern Colorado and am a performance coach and collaborator at Central Washington University. She has previously taught workshops at the Autumn Artist Retreat and in the Iron Mountain Arts studio near Port Gamble.